Are employed at least 20 hours per week OR a student taking at least 12 credit hours. Once you apply, your application will be reviewed and you will be contacted by a C&FR staff person by email. If you are potentially eligible, you will be placed on the Wait List until enrollment takes place, depending on availability of funding. Once funding for School Readiness becomes available, it is distributed on a first come first served basis and an application packet will be mailed to your residence. Please call ELC monthly to verify your information and check your status on the wait list. If you move, be sure to update your address. For any questions, contact Child & Family Resources at 904-208-2044 x1 or via email at ccrr@elcofduval.org. 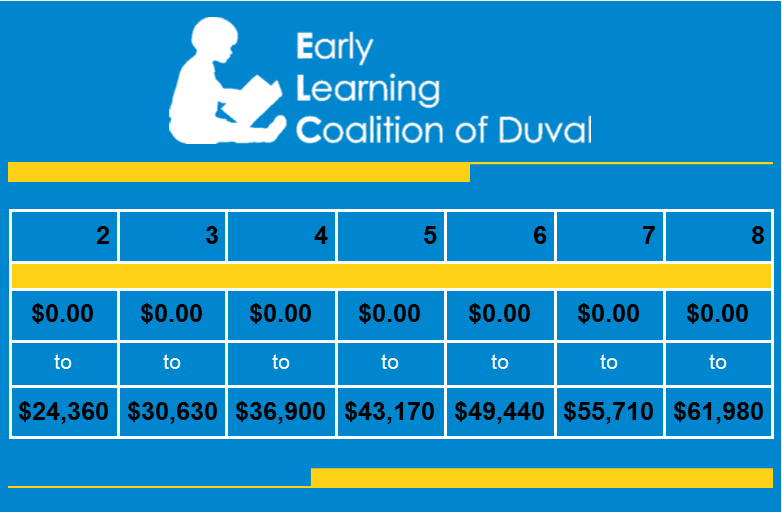 Success By Six: This is a partnership between the Early Learning Coalition of Duval and the United Way of Northeast Florida. The program offers FREE two-year scholarships for families of 3-year-olds. Eligible families are awarded a scholarship and agree to be a part of this program for two years and participate in the family programs provided. Families must be employed 20 hours a week or more and have a gross annual income of 130-200% of the federal poverty level. Child Care Executive Partnership (CCEP):. In a partnership with employers and other community partners, CCEP helps parents pay for child care. Qualifying incomes must 200% or less of the federal poverty level. Children can be eligible from birth up to age eight. 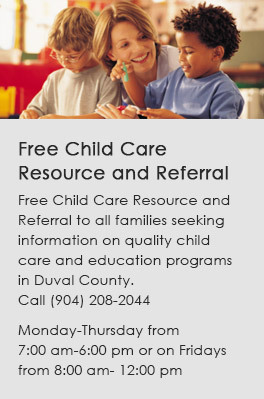 Call Child Care Resource & Referral for more information at 904-208-2044 x 1. Pre-K program. To be eligible, children must be Florida residents and turn 4 years old by September 1 of the school year. Lutheran Services Florida Head Start/Early Head Start Program: This FREE preschool program serves pregnant women and children from birth to three years of age; and children 3 or 4 years of age by September 1st of a program year or age 5 by September 2nd or later. Head Start/Early Head Start is a free preschool program for all who qualify. Call Head Start at 904-423-8637. Episcopal Children's Services Early Head Start Program: This FREE preschool program serves pregnant women and children from birth to three years of age. There may be some income requirements associated with this program. Call 904-726-1500 for program information.